It’s a statement we hear almost every single day while working with our beautiful Las Vegas bridal clients. 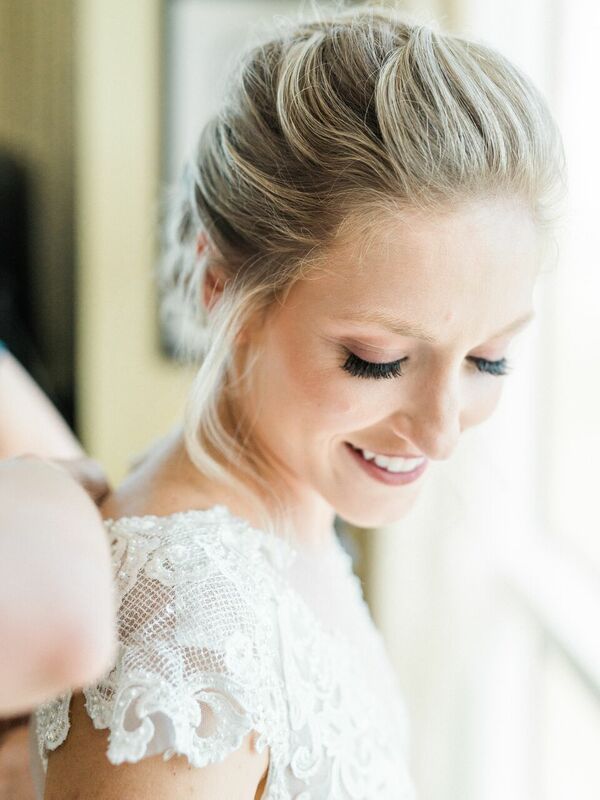 While the excitement of such a special day and compete joy of getting to marry your love most certainly add to that “wedding day glow” there’s some work to be done to achieve that look on your wedding day and everyday. Keep in mind that good skin does not come into play one week before the wedding. You should start now and invest in your face for not only your wedding, but for your lifetime. Good skin care starts from within… here are a few best practices to get you on your way to healthy glowing skin. Here’s a secret most dermatologists will tell you: Don’t use a washcloth on your face. Amy Wechsler, MD, a psychiatrist, dermatologist and author of The Mind-Beauty Connection: 9 Days to Less Stress, Gorgeous Skin and a Whole New You, washcloths can harbor bacteria. Instead, use just your hands. But first, use a separate makeup remover to tackle waterproof mascara and long-wearing lipstick. Every time you swipe on your blush with a dirty brush, you add a layer of acne-causing bacteria to your skin. Cleaning your brushes is easy, just read our 3 DIY Tips To Clean Your Makeup Brushes to learn more. Next, here’s are a few products that we recommend. When it comes to acquiring that oh-so-coveted glow that is being shown in magazines and on runways are often pointed towards shimmering cosmetics and products that have a bit of sparkle in them. This recommendation is for a product line that works on your “glow” beneath the shimmer and sparkle. VITAL C is absolutely packed with antioxidants and natural botanic ingredients that will repair, sooth and nourish your skin, giving you the best possible canvas to shine on your wedding day!! This powder is one of our hands down favorites when it comes to creating a natural healthy look. The ultra fine mother-of-pearl particles is versatile enough to provide a touch of glowing glamour and lovely glow to fair skinned beauties and dark skinned lovelies alike. The description on the MAC site is “Soft coral with golden shimmer”- how fantastic is that?! The coral pigment is perfect for adding a fresh rosy glow to the cheeks and just like MAC products in general, you can be confident that it is made with high quality ingredients and will last through out the day. We know you have a million and one things to remember for your wedding day be sure to add a skin care plan to your list TODAY! Be sure to visit us on Instagram for incredible wedding makeup inspiration! We’d love to hear about your day! Please take a moment to visit our contact page and introduce yourself. Previous Previous post: Why choose Makeup In The 702?